According to Color Lines, after a year of fundraising, the National Black Mama’s Bail Out campaign raised enough money to post bail for 100 Black mothers awaiting trial, reuniting them with their families in time for Mother’s Day. The campaign is led by the National Bail Out Collective, an organization working to end pretrial incarceration. A Black woman is facing a two-year prison sentence for upholding the stand-your-ground law in Michigan. Siwatu-Salama Ra defended herself, her mother, and her two-year-old daughter with a registered, unloaded gun after a woman tried to hit them with her car. Michigan is an open carry state, and the way Ra defended her family was perfectly legal—yet she was still incarcerated. Ra is also seven months pregnant and is receiving dangerously insufficient medical care in prison. Read more on Vox. The LA Times reports that Trump plans to cut the budget for Children's Health Insurance Program, or CHIP, in half, three months after Congress gave it a ten-year extension. The CHIP budget is already low at $14.5 billion, and 9 million children and pregnant mothers depend on it for medical care. The women of this year’s Cannes Film Festival jury are both brilliant and stunning, and they know it. When asked by a journalist if she thought the focus on red carpet fashion was “frivolous,” president Cate Blanchett replied, “Being attractive doesn’t preclude being intelligent.” Preach! The rest of the jury comprises Ava DuVernay, Kristin Stewart, Léa Seydoux, and Burundian singer Khadja Nin, and each and every one of them are dressed to kill. See the photos from yesterday’s red carpet event on Vulture. Variety reports that Jordan Peele has announced a new film called Us (details of the plot withheld), set to premiere on March 15, 2019. Lupita Nyong’o, Elisabeth Moss, and Winston Duke are in talks for lead roles. Our queen Amy Poehler is at it again with a new series she produced with Adult Swim called Three Busy Debras, a new absurdist comedy about three housewives in a wealthy Connecticut suburb that “exists outside of reality as we know it.” Sandy Honig, Mitra Jouhari, and Alyssa Stonoha will star in the inventive new comedy. Read more on The Hollywood Reporter. 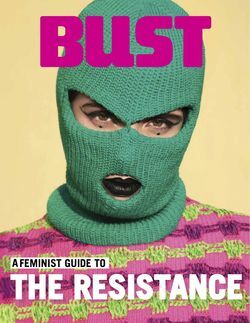 Elizabeth F. Olson is an editorial intern at BUST. She mostly writes about her experience with mental illness through a feminist lens, and sometimes she writes fiction. Find her on Instagram and Twitter.